U.S. President Donald Trump and Kim Jung Un meet in Hanoi, Vietnam via social media. U.S. President Donald Trump on Friday announced that he is rolling back new North Korea sanctions that his own Treasury Department put in place a day previous. Mr. Trump posted his decision via Twitter, showing a major contradiction with the foreign policy set by his own administration, appearing to also confuse the day the sanctions were released. The Treasury Department on Thursday imposed new sanctions on dual Chinese shipping companies that it says have been helping Beijing avoid international sanctions, the first set of economic punishments targeting Pyongyang since 2018. 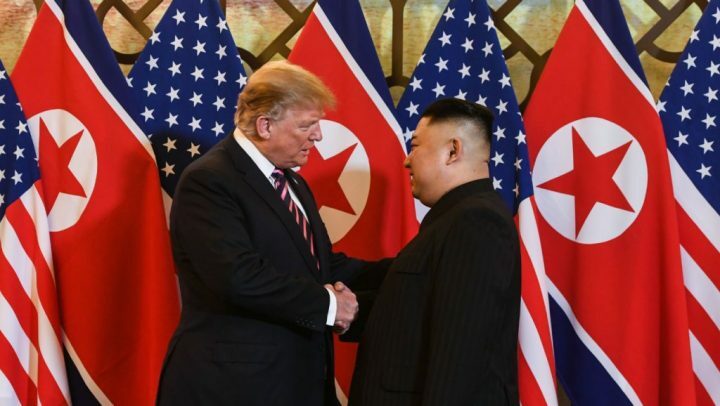 It also comes a month after talks between Trump and North Korea’s leader Kim Jung Un, formally the chairman of the Democratic People’s Republic of Korea, or the DPRK. Trump and Kim had a rocky relationship starting when the U.S. president was inaugurated in January 2017, however, taunts between the pair that concerned some military analysts turned into the possibly of a historic summit between the pair. In 2018, the first meeting between a sitting U.S. president and the leader of the isolated Asian nation occurred , and the pair shook hands and looked to work towards denuclearization. A second summit took place earlier this year. Ahead of the meeting in Hanoi, Vietnam, it was expected that the two countries would attempt to sign a deal for North Korea’s denuclearization. However, the meeting ended without an agreement, with Trump saying they walked away because a deal could not be reached. He made clear that the relationship between the two was still strong, however. Following the Treasury Department’s newly announced sanctions, North Korea withdrew from a joint liaison office near the demilitarized zone with the South, a negative sign amidst an ongoing peace process between the two countries.